There are absolutely NO limits the amount, or duration of attacks blocked. This feature is highly effective in blocking all types of attacks and mitigation occurs automatically so you experience zero connection issues. Currently HostingFuze is only offering protected IP’s in Romania, France, Canada but will soon be offering in USA data centers. If you are a serious gamer, a VPN with DDoS protection is a must. Player’s IPs are often harvested through Skype, malicious websites, or shady server admins, so protecting your personal IP address from falling into the hands of your enemy is key. Killing off potential attacks before they get to you can very well mean the difference between winning or losing a match. 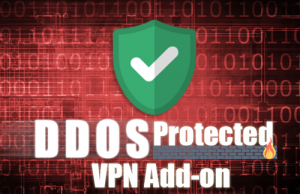 Who Needs DDoS Protected VPN? DDoS attacks have always been a nuisance for online businesses and their customers. Online businesses are always likely to face a DDoS attack due to their sheer size and the amount of data they hold. Are you running an E-Commerce website? Have you ever experienced a problem in your billing cycle? Suddenly, something goes wrong and your website becomes unable to process payments. This is due to DDoS attacks. When your competitor can’t beat you with its services, they try new ways to ruin your reputation; and one way to do so is DDoS attacks. By targeting a lot of traffic on your server, they can jam your server that in result kills your internet speed, hence no payments. HostingFuze VPN’s DDoS Protected VPN helps you to block all such traffic and keep your system running butter-smooth. According to a recent report, gaming servers are on the hit list of dangerous DDoS assaults. They have been targeted by some of the greatest and most extensive attacks in recent history. Over the years, gaming has slowly shifted towards an online model. Plus, the easy availability of the internet has conditioned us to expect continual connectivity — both in massive multiplayer online and single-player experiences. However, online gaming platforms are highly vulnerable to latency and connectivity issues, making them ideal targets of DDoS attacks. HostingFuze VPN’s DDoS protection add-on protects a gamer against all kinds of DDoS attacks to keep things fair and competitive. If you are hosting a P2P sharing website and you have huge numbers of visitors’ everyday, then it’s difficult for you to secure your system from different attacks. Most of the times, it happened that a large number of fake users make the server so busy that genuine users don’t get the chance to download files from your server. To make you run your business smoothly, HostingFuze VPN offers DDoS dedicated IP that helps to provide your website maximum uptime by keeping unnecessary traffic away from your server. Forex business is all about taking action in real time. A delay of even a second can make you suffer a loss of hundreds of bucks. DDoS attacks are ultimate threat for forex traders. Just imagine, if there’s a DDoS attack on your device that kills the internet speed and at the same time, the commodity you invested in drops to its lowest price and you can’t take any action. HostingFuze VPN’s DDoS protected VPN safeguards you from such incidents. What Are The Benefits of DDoS Protection?